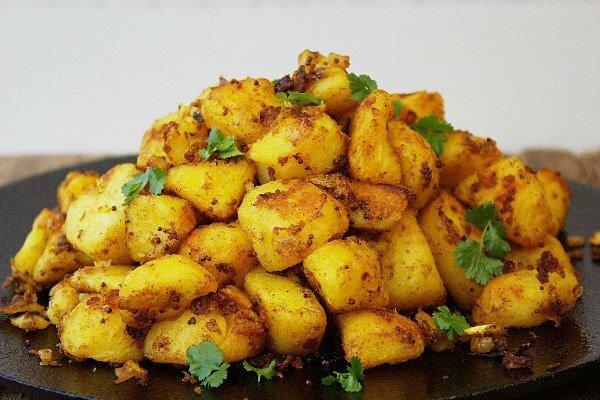 Easy Bombay Potatoes – the best ever Indian Spiced Roasties. The perfect partner for any curry recipe or to spice up your Sunday Roast! 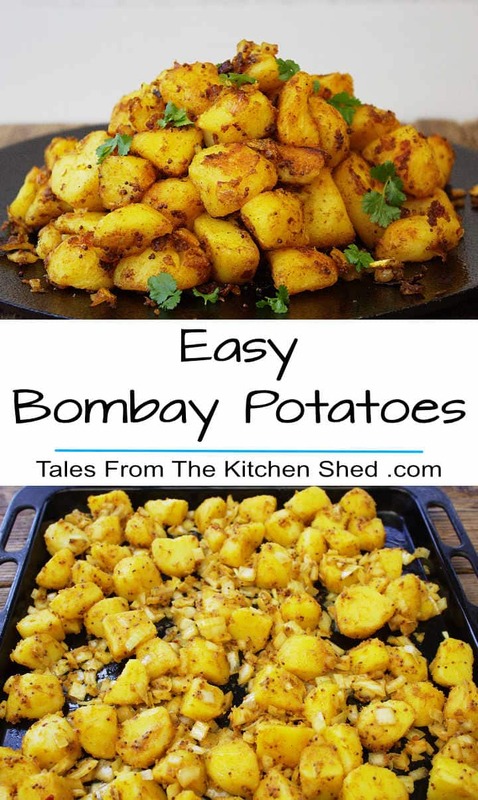 I thought it was about time to share my recipe for Easy Bombay Potatoes with you. I’ve been making Bombay Potatoes this way for years and although I’ve posted photos on social media I’ve never got around to sharing the recipe… so here goes. Whenever possible I use Maris Piper potatoes but any floury potato variety works really well. Leftover boiled or roasted potatoes can be used, just see my note at the bottom of the recipe. If main crop potatoes are out of season, the recipe still works with new potatoes. The potatoes are par boiled with turmeric to give that gorgeous golden colour. And then tossed in a mixture of curry paste, onions, oil and black mustard seeds. After that it’s simply a case of popping them in the oven for about thirty minutes to give crispy spicy potatoes you won’t be able to resist. No curry night at the Kitchen Shed would be complete without Easy Bombay Potatoes and I regularly serve them at our BBQs alongside my Tandoori Chicken kebabs (recipe coming soon). We’ve also been known to have these “spicy spuds” with a Sunday Roast. I hope you enjoy Easy Bombay Potatoes as much as we do. Here’s the recipe in quick printable format so you can have it to hand while you try it out. 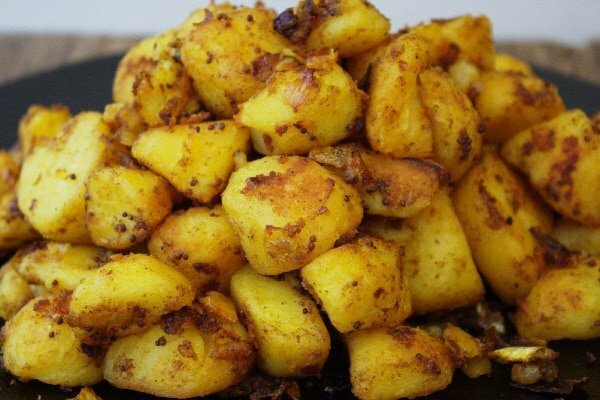 Easy Bombay Potatoes - the best ever Indian Spiced Roasties. The perfect partner for any curry recipe or to spice up your Sunday Roast ! Preheat oven to 200℃ / 400℉ /Gas Mark 6. Place the potatoes in a large saucepan and cover with water. 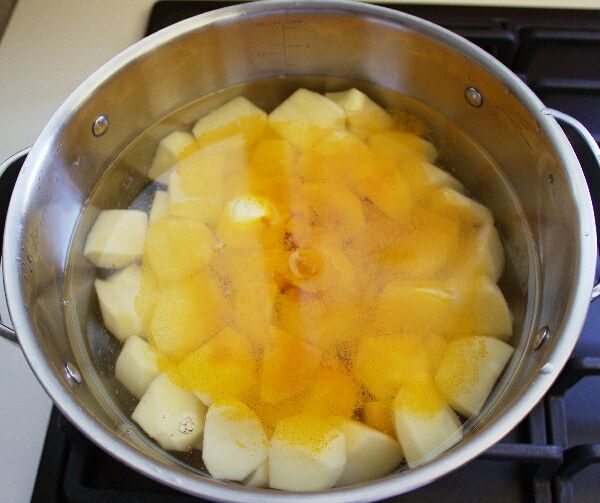 Add salt and turmeric before bringing your potatoes to the boil and then simmer gently for 5 minutes. 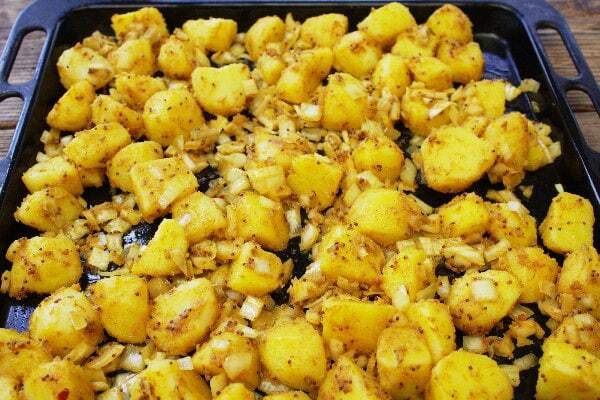 Drain your potatoes and toss them with the remaining ingredients; ensure all the potatoes are well coated. Turn out into a large roasting pan and pop in the oven for 30 to 40 minutes until nice and crispy. When using leftover boiled or roasted potatoes, simply toss the potatoes in a mixture of turmeric, curry paste, onions, oil and black mustard seeds before popping in the oven for 20 minutes. The No Waste Food Challenge created by Elizabeth over at Elizabeth’s Kitchen Dairy and hosted this month by Michelle at Utterly Scrummy. Breakfast!!! With fried eggs. Better than hash browns for sure!!! I’m so pleased to hear my recipe went down well at your curry night, sounds like a very tasty menu. It’s a pleasure to share the recipe. As my scale does not have “medium” on it. What is the total weight of the potatoes used in this recipe? 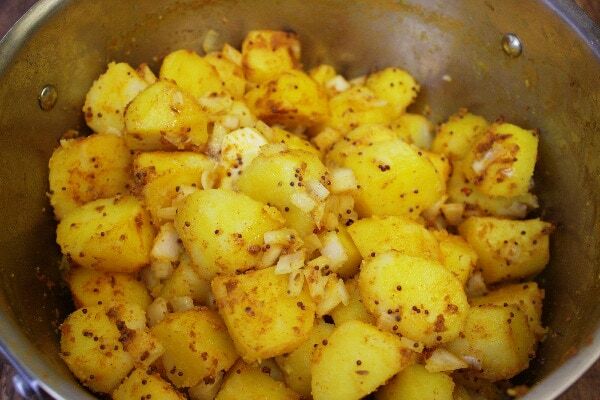 just made your bombay potato dish for tonights curry look and taste great,better than chips. Thanks Tina, curry powder would work well, you may need an extra tablespoon of oil as there is oil in the paste. Do let me know how you get on. These were absolutely lovely – one observation is that they needed a good dash of seasoning during the baking time as the salt in the boiling water wasn’t enough for me. I also baked them for a bit longer to make them super-crunchy! Thanks Jane, I’m so pleased you enjoyed them. 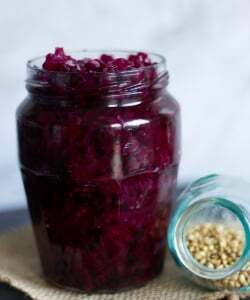 Thanks for the feedback it’s really useful, I tend to go easy on the salt for health reasons but I think I’ll amend the recipe amount to half to one teaspoon so people can choose how much to use. Thanks Candace, Bombay Potatoes are a favourite here too and they’re so easy to make. Let me know if you do get time to make some. THEY ARE JUST DELICIOUS! HEALTHY, CRUNCHY AND TASTY! I can’t wait to make these…thanks for the share! Wow what a delicious looking recipe 🙂 I have pinned these for later. Such a great recipe, so much flavour ?? What a yummy sounding potato loaded with flavor. Thanks for sharing with us at Fiesta Friday. Happy FF! I have more trouble finding a great side dish than anything else. These potatoes look delicious and I just love how you crisped them up for perfect texture too! Thanks Julie, the crispy bits of spicy potato and onion are OH’s favourite. What a fantastic spin on potatoes! Sounds heavenly! Hi! I saw these @ Fiesta Friday and wanted to transport them directly to me! Look so tasty! Looks like I’m going shopping! Thanks Michelle, do let me know how you get on. 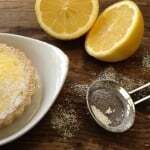 What a fab recipe! I have tried other recipes for Bombay Spuds in the past that suggested frying the potatoes, but they never end up crispy! This recipe was easy to follow, easy to do (very little watching of spuds needed, unlike frying! ), and most importantly very very yummi!!) thanks for sharing! Thanks Sarah, so pleased you enjoyed my Bombay Potatoes. Frying is the traditional way to make Bombay Potatoes and some recipes have tomatoes in too, I wouldn’t be able to say my version is authentic but they are spicy and delicious. Yummy, these look great! 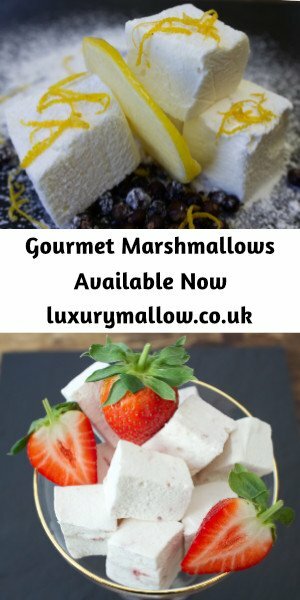 I defnitley need easy recipes, I will be trying these out! I LOVE potatoes, and these look fantastic! My dad used to make a dish similar to these, but I had forgotten all about it. I’ll have to try these sometime! Thanks, hope you enjoy Easy Bombay Potatoes as much as we do. These look so yummy!! Which curry paste do you use when you make them? Thanks Charlotte, I used Sainsbury’s Madras Curry paste which is quite hot but you could use a milder paste. I love potatoes made like this Sarah, but I’ve never tried re-creating them at home. 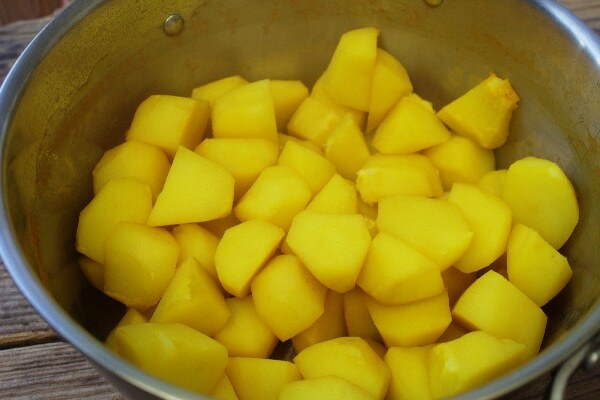 Great idea to use turmeric to bring that lovely colour to the potatoes. Thanks Michelle, potatoes are a firm favourite here at the Kitchen Shed too. Oh wow, these Bombay Potatoes look so delicious Sarah! Thanks for a fabulous entry to #CreditCrunchMunch!